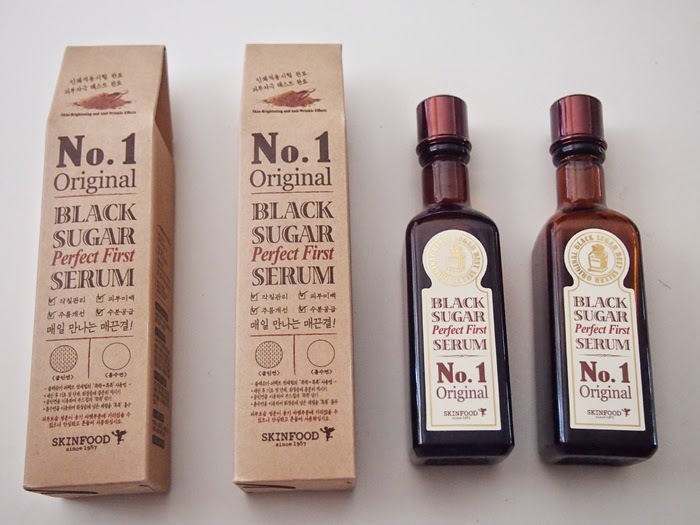 Skinfood's Black Sugar line is one of their best selling lines. I purchased two of these serum and cotton pad sets back in Christmas 2013 and promptly used them up in the first half of 2014. This is a first essence meaning you use it straight after cleansing. 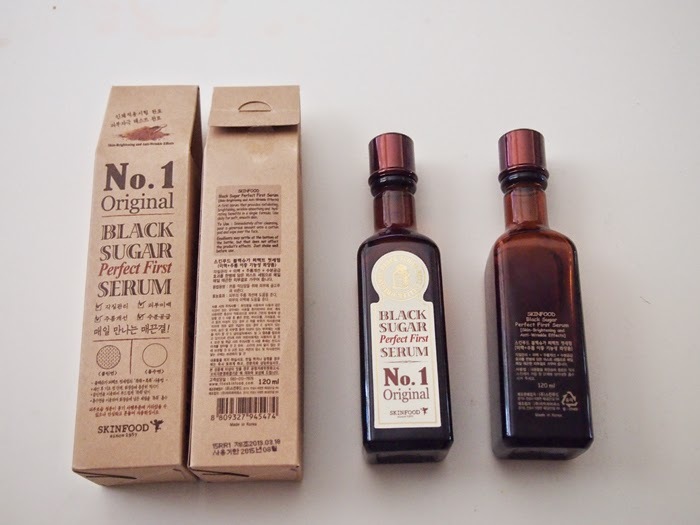 It's supposed to help your skin absorb your other layers (e.g., serum, essence, cream) better. This formula contains niacinamide as the fifth ingredient for brightening! Alcohol is the third in list, so you may want to be careful if you are sensitive to alcohol. 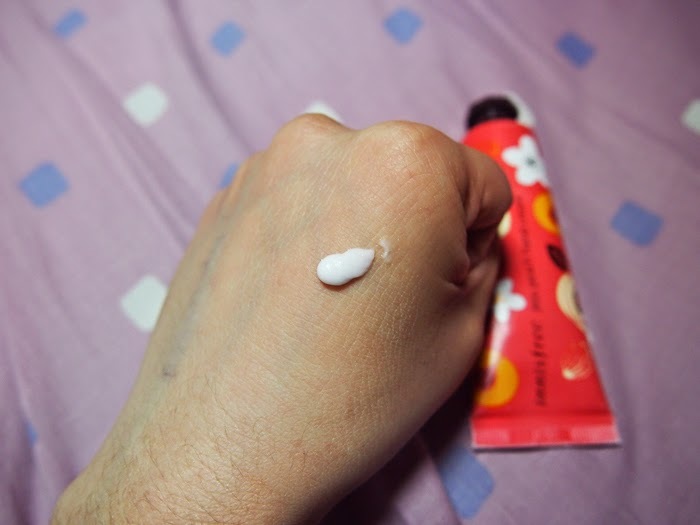 My hands are so dry, so I have been on the look out for nice, fruity hand creams. 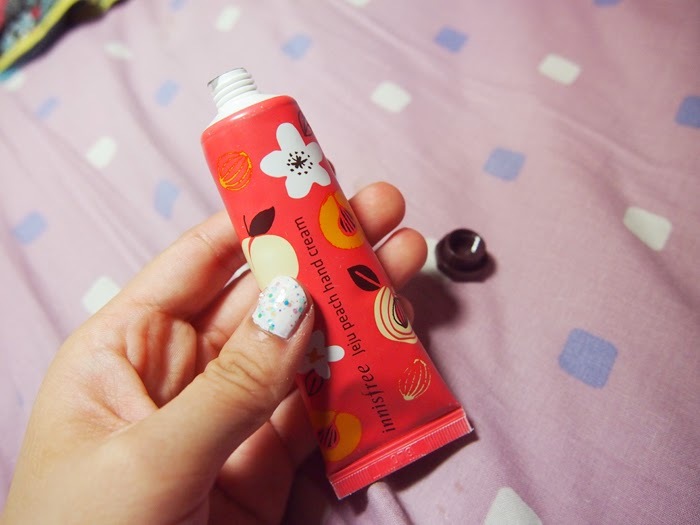 I was using this during Spring/ Summer when butters and heavier creams were too heavy (yes, my hands still get chapped during warmer seasons). Innisfree as a brand didn't appeal to me all that much, but I am trying to get more familiar with them. So far, I've purchased a lipstick, lip concealer, several sheet masks, and a hand cream. Contents: 30mls. It comes in a somewhat flimsy plastic tube. The colour from the packaging may rub off; especially the ends of the tub, and the circular neck area. This hand cream has a light, airy texture. It was just enough for me in the Spring/ Summer seasons, but I don't think it will be moisturising enough for the Autumn/ Winter months. It has a very strong, fruity peach candy smell. I love the scent! 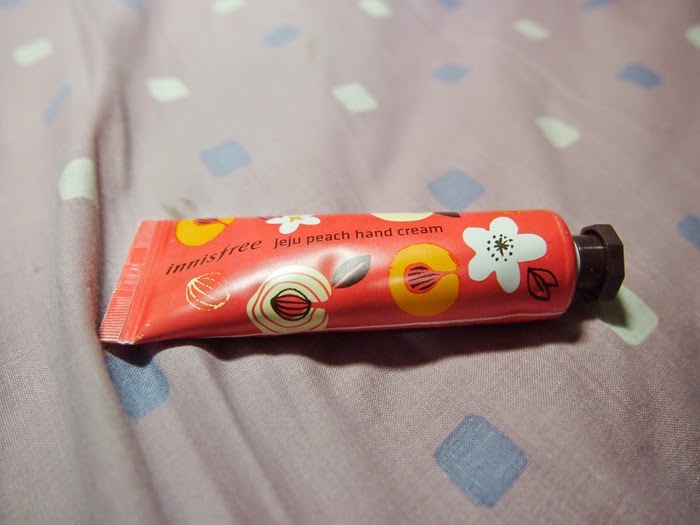 The scent of the hand cream will linger, so be cautious about purchasing if scents give you a headache. I would recommend the Nature Republic hand creams which have since been renewed in 2014 for a more subtle fruity scent, and a steamed cream texture. I think they also had a fig one at some point. I would love to try that one as I prefer fruit scents to flowery or nutty scents! Repurchase? Sure, why not? It's a reasonable price, smells nice, and does the job in warmer months. 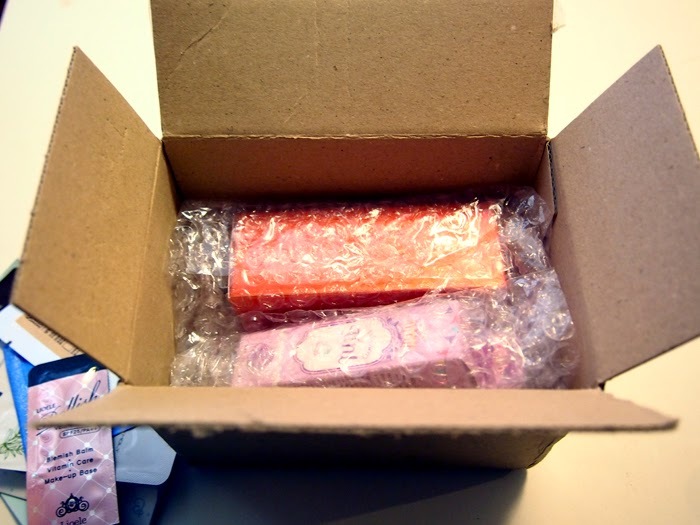 Since there is still that awesome free shipping Mizon deal on Roseroseshop (you just have to pay $2.50 for a tracking number per order/ package), I will write a review of a Mizon product! I purchased this way back in October 2013 . I'm sure everyone has heard of Skinfood's famous Black Sugar Mask Wash Off right? I thought this might be a good product to try and to ascertain that Skinfood's famous Black Sugar Mask Wash Off is famous for a reason. 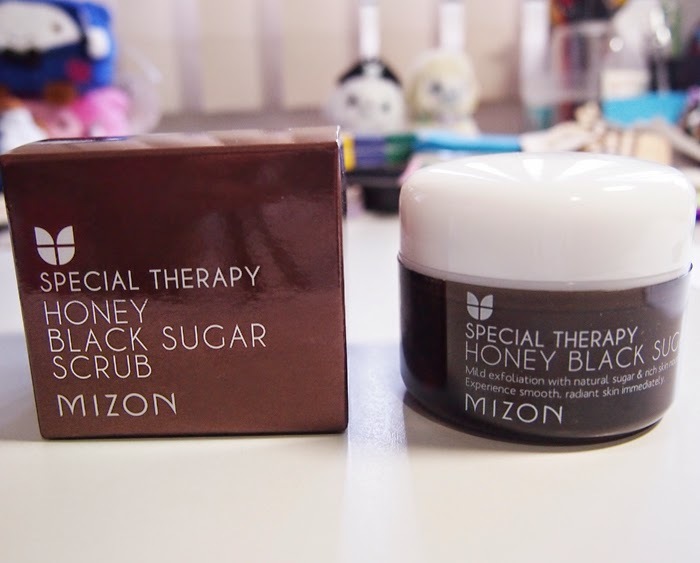 However, Skinfood has since released their version of the Honey Black Sugar Mask Wash Off in 2014, so I guess that product would be most comparable with this Mizon Special Therapy Honey Black Sugar Scrub. What They Say: Natural black sugar powder exfoliates dead skin cells and black heads effectively and controls excessive sebum. Honey and various plant oils nourish skin, leaving it radiant and smooth. Contents: 90g in a plastic tub. Comes with a plastic separator. Application: While face is still wet after cleansing, apply a proper amount, avoiding eyes and lips. Massage softly, drawing circles, then let it set for 5 minutes. Wash off with lukewarm water. 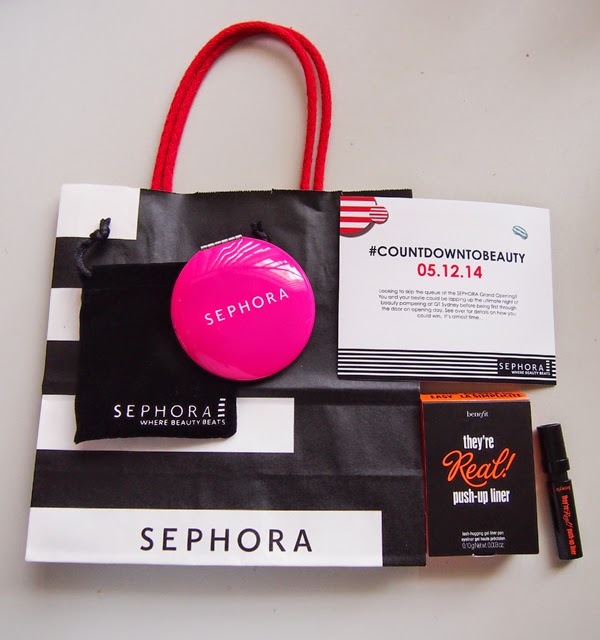 On the 1st, 2nd, and 3rd of December, Sephora will be handing out little gifts to help celebrate the opening. Today is a pink compact mirror! I don't think I'll be back the other days, and it's probably not worth lining up for the freebies, but do drop by if you are close. TIP: Benefit is also doing a liner swap until the 5th of December. Just bring in an old eyeliner and swap it for a free sample of They're Real Push-up Liner! There's a Benefit inside Myer at the Westfield right across the street from Pitt St Mall if you are going to visit Sephora.